Doryun Chong, chief curator, M+ Hong Kong, and Herb Tam, curator and director of exhibitions, Museum of Chinese in America, will discuss Tseng’s life and art in New York, his influence on younger Chinese artists, and how his cultural identity may have impacted his work. Generously supported by the Asian Cultural Council. 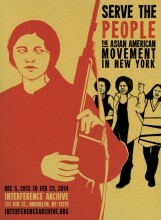 Co-sponsored by the Museum of Chinese in America and NYU’s Grey Art Gallery. Muna Tseng will offer walk-throughs of the exhibition “Tseng Kwong Chi: Performing for the Camera” on Wednesday nights in the month of June. Please RSVP with your date to reserve your spot. The tour from 7.00 to 7.30 pm FREE. CUNY TV features the two current exhibitions on Tseng Kwong Chi at the Grey Art Gallery and the Metropolitan Museum of Art on its Asian American Life, an in-depth news magazine program that addresses topical issues affecting the Asian American communities nationwide and profiles Asian American leaders. Paul Lin interviews choreographer Muna Tseng about Kwong Chi’s life and her tribute to him in her dance-performance piece “SlutForArt a.k.a. Ambiguous Ambassador”. This entry was posted in Announcement, Exhibitions, Talk/Panel and tagged Asian American Life, Doryung Chong, Grey Art Gallery, Herb Tam, Muna Tseng, Museum of Chinese in America, NYU, Tseng Kwong Chi on June 9, 2015 by achang. Explore Tyrus Wong’s craft, as well as lasting influence of his artistic vision and style. Free with admission! In celebration of the Museum’s 35th anniversary this spring, MOCA is proud to present Water to Paper, Paint to Sky: The Art of Tyrus Wong. Celebrated painter, muralist, kite-maker, lithographer and calligrapher, Tyrus Wong is one of the greatest Chinese American artists of the 20th century. This highly anticipated exhibition showcases his extraordinary body of work including Disney’s iconic American children’s classic, Bambi. Water to Paper, Paint to Sky: The Art of Tyrus Wong is organized by The Walt Disney Family Museum, San Francisco, CA. This retrospective exhibition features Wong’s extensive body of work which includes his paintings, hand-painted ceramics, original greeting cards, works on paper, and latest kite creations. It was the ethereal beauty of Wong’s Eastern influenced paintings, his sense of color, richness, and imagination that caught Walt Disney’s eye and became the inspiration for the animated feature Bambi (1942). Wong’s singular vision and impressionistic art influenced the groundbreaking movie’s overall visual style and changed the way animation art was presented. Wong was one of the bohemian artists whose creativity and drive helped shape the cultural, artistic life of Los Angeles during the 1930s and 40s. He carved out a creative career working as a Depression-era muralist, California watercolorist, and film production illustrator. Wong worked at the Warner Bros. studio from 1942 to 1968, creating concept images for many films includingRebel Without a Cause  and The Wild Bunch , to name a few. These artworks conjured stunning environments, in many cases resembling beautifully executed architectural renderings. During the run of the exhibition, MOCA will offer a line-up of events, public programs, tours, and educational workshops. On May 14, at 7PM, join Academy Award-winning filmmaker and animation historian John Canemaker on a talk on Tyrus Wong’s influential and unique contributions to the art direction of animated feature film Bambi (1942) and his experiences working at the Walt Disney studio. Please check back on the Museum’s website for upcoming exhibition-related programs. This exhibition and related programs are made possible with public funds from the New York State Council on the Arts with the support of Governor Andrew Cuomo and the New York Legislature. Additional support for the exhibition is provided by The Starr Foundation and Anla Cheng & Mark Kingdon. In-kind shipping has been provided by DHL. This entry was posted in Exhibitions, Talk/Panel and tagged 1882, academy award, Bambi, China, Chinese Exclusion Act, Chinse kites, Depression, Guangdong, handmade kites, John Canemaker, kite, Los Angeles, MOCA NYC, mural, Museum of Chinese in America, Paint to Sky: The Art of Tyrus Wong, Rebel Without A Cause, The Wild Bunch, Toishan, Tyrus Wong, Walt Disney, Water to Paper, World Kite Museum and Hall of Fame on April 14, 2015 by achang. America through a Chinese Lens surveys photography of American life as shot by contemporary Chinese and Chinese American artists, documentary photographers and non-professionals, identifying the specific ways in which the Chinese have used the camera to see this country – its beauty, contradictions, and realities. The exhibition spans many generations of photographers: contemporary artists who use the medium as well as snapshots taken by new immigrants from the 1950s to today which have been selected from MOCA’s permanent collection. During the run of the show, new media artist and design strategist An Xiao will be shooting and posting photographs regularly as she travels throughout the west and southwest, offering a live visual essay about her America on our tumblr page: chineseinamerica.tumblr.com. June 4, 1989: Media and Mobilization Beyond Tiananmen Squaredraws from MOCA’s extensive collection of Asian-American and Chinese-language periodicals to reconstruct a narrative of the coverage of and response to the Tiananmen Square protests and massacre of 1989. These periodicals tell the story of the sister movement sparked in America: thousands, mainly young Asian-Americans, marched and rallied in cities across the country in solidarity with the Chinese protesters. The crackdown of June 4 politically galvanized the Chinese-American community, and the protests escalated. Amidst the current renaissance of popular protest, June 4, 1989: Media and Mobilization Beyond Tiananmen Square offers a chance to reflect critically on the inseparable roles of protester, journalist, and spectator at home. This entry was posted in Exhibitions and tagged Herb Tam, MOCA NYC, Museum of Chinese in America, Ryan Wong on April 24, 2012 by achang. Your invitation for Feb 23 to an exhibition walk-through and conversation with artist Lee Mingwei at Museum of Chinese in America. Copyright © 2012 Asia Art Archive in America, All rights reserved. This entry was posted in Exhibitions, Talk/Panel and tagged Asia Art Archive, Herb Tam, Lee Mingwei moderated by Jane DeBevoise, Museum of Chinese in America on February 21, 2012 by achang. The Travelers & the Quartet Project is a solo exhibition of works by Taiwan-born American artist Lee Mingwei, inspired by the artist’s own itinerant early life and the stories of Chinese immigration to America. Both projects address the essential question of “where is home?” and contribute to the dialog on the legacy of Chinese in America from an artistic point of view. Join MOCA for a conversation with Lee Mingwei and Eugenie Tsai, Curator of Contemporary Art at the Brooklyn Museum. Click here for more information on The Travelers & the Quartet Project. Admission: Free and open to the public, courtesy of TARGET. RSVP required to programs@mocanyc.org. This entry was posted in Exhibitions, Talk/Panel and tagged Eugenie Tsai, Lee MIngwei, Museum of Chinese in America, NYC on October 12, 2011 by achang.